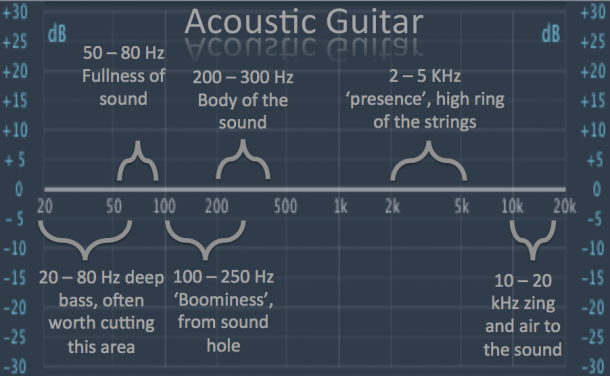 I found this really handy picture that breaks down the acoustic guitar EQ in the frequency spectrum. Each frequency range in the image corresponds to a specific character in the acoustic guitar’s sound. Like I’ve said time and again, filter out the low-end of the guitar to make room for the bass guitar and kick drum. Even if you’re doing a solo, singer/songwriter act, it’s worth cutting that lowest end out. You can’t really hear the actual frequencies, but they can add extra low-frequency noise your audio doesn’t need. If the acoustic guitar is the main player in your song, filtering up to about 80 Hz or so could be enough. If it’s a full band production, your can filter the low-end out even further. It just depends on how full you want your acoustic guitar to sound. Extra fullness in this frequency range adds thickness to your audio, while too much can interfere with other instruments. That’s why so many mixes end up sounding muddy. All the instruments occupy that same space between 100 – 250 Hz. So unless your acoustic guitar sound sounds really thin and weak, I suggest cutting in that area. Cuts in your acoustic guitar EQ in the lower-mids add subjective boosts to the higher mids, giving your acoustic guitar more presence. Also, if you pointed your microphone at the sound-hole when you recorded your acoustic guitar it might sound pretty boomy. Cutting at 200 Hz can fix that boomy acoustic sound. Sweeping around this area is helpful if you need a little extra body to your acoustic guitar sound. Small boosts can add the extra weight to your acoustic guitar, especially when the lower frequencies only add mud and boominess. This is not in the picture but it’s worth mentioning. Cut in the area around 800 Hz to get rid of that cheap string sound you hear on inexpensive acoustic guitars. A narrow cut in the acoustic guitar EQ there can really smooth out the sound. Once you cut the lower-mids, you don’t always have to boost the higher mids to add presence. There’s enough presence by just adding a little extra volume to compensate for your low-mid cuts. However, if your acoustic is still sounding a little dull, a broad boost in the area between 2 – 5 kHz can add some more brightness and attack. I would actually recommend going all the way up to 8 kHz for that extra brilliance to your strings if you like that sort of sound. For just an overall facelift to your acoustic guitar sound, add some air with the highest frequencies. I recommend restringing your acoustic often so that the strings don’t lose their brilliance, but if you need to add some extra sheen to them, here’s where you go. Remember theses simple guidelines the next time you slap your EQ on that acoustic guitar track. It’s a simple and easy way to navigate the frequency spectrum of your acoustic and results in a better acoustic guitar sound. If you want a simple, no-fuss guide on EQ, complete with a 1-hour mix walkthrough then head on over and check out my EQ Strategies – Ultimate Guide to EQ. For more mixing tips like these, sign up for my 70 tips to cleaner mixes.